Winds Girls – all dresses are in, labeled and placed in the uniform room. Please pick them up asap as parents are responsible for any alterations and hemming. Concert is in 1 week. Concert and Symphonic Band – Most all the uniforms alterations are finished and are labeled and in the uniform room ready for pickup. Please pick up asap. Raise money for the Lakota West Marching Firebirds during the first half of home football games. Receive free entry to the game and have fun! 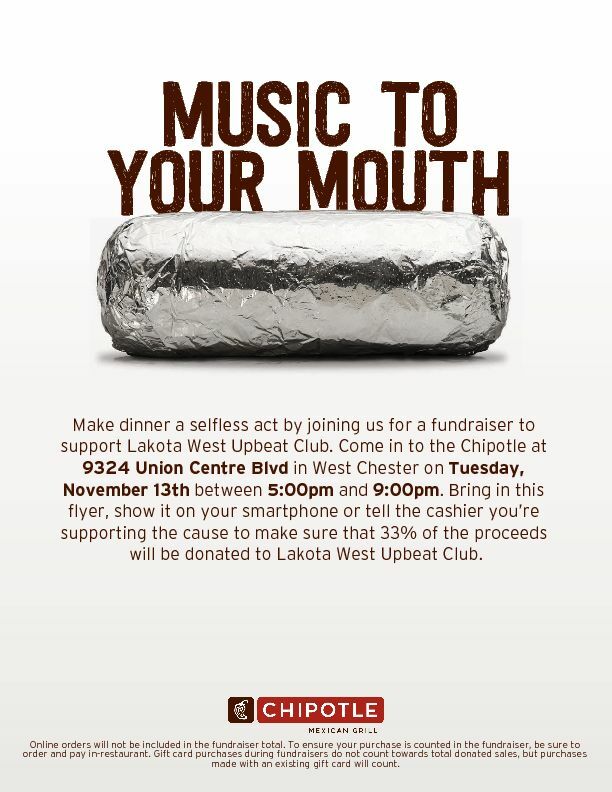 The Lakota West Upbeat Club is developing a new corporate sponsorship program for 2018. Local businesses will have the opportunity support the band in exchange for advertising on our concert program, website, and/or truck. We’re looking for a few volunteers (ideally parents of freshmen and sophomores) to help build the program. If you have a knack for graphic design, we’d love to have your help putting together our concert program for the year. Local business owners with fundraising experience or community contacts would be a great help soliciting sponsors and designing the structure of the program. Finally, if your business would be interested in sponsoring in the band, please contact us at sponsorship@lakotawestbands.org. Some of the items this group may work on include concert programs, solo & ensemble guide, potential truck wrap, senior pic keepsake, bannars, Jazz n’ Cakes placemat, video, and program, and sponsorship promotional materials. This team would work closely with the Upbeat co-presidents and communications lead. Co-Chair needed to work with Chair: Cindy Merk. Swing Dance is Friday December 7. You do not need to have a jazz student! This role will assist the chair with the duties outlined below. The Swing Dance chair organizes the Swing Dance, an Upbeat Club fundraiser benefiting all bands and color guard and featuring all jazz bands on usually the 2nd Friday in December. The busiest time for this chairperson is the month leading up to the Swing Dance and includes soliciting donations from local businesses for door prizes, communicating with the jazz director to solidify details, creating a sign-up genius for volunteers, spreading the word throughout the community, communicating with band families for donations of food, decorating, set-up, and tear-down. It works best to include a co-chair for sharing responsibilities and also so that information can be shared to future organizers from more than one source. Plan a meeting or get-together and help support the band! Spiritwear can be picked up each week in the stands at Thursday night practices. Questions contact spirit@lakotawestbands.org. The Spiritwear shop will reopen Monday 10/1 through Sunday 10/7 so that orders can be processed in time for Indy trip. See link to order here. Medication process outlined by district is for ALL meds, even OTC. Please review letter provided on trip page as there is no wiggle room on this. Friday 10/5 – East/West Game at East. Band will perform at halftime. NOTE – no buses for transport, students meet at East. Saturday 10/6 – mini band camp from 9am – 9pm. No meals provided.